As we know them today, Choux pastry was created by a pâtissier named Avice in the 18th century. They were named as such because they looked like little cabbages and the French word for cabbage is “choux”. The original recipe though is thought to have been created in the mid-sixteenth century by an Italian chef in the service of Catherine de Medici. Choux pastry is one of the quintessential French recipes. The pastry itself is quite easy to make but it’s what you do with it that contains the ‘WOW’ factor. The show-stopping French wedding cake, the Croquembouche, is a tower made of choux pastries, covered with caramel and spun sugar. Profiteroles, éclairs and churros all use the same basic choux recipe and as well as gougères, which are a savoury option, filled with cheese. For something simpler, why not try filling them with my delicious orange and vanilla crème pâtissière and coating them in a crunchy caramel topping. They will make the perfect dessert to share with friends or family after a delicious meal or to entertain guests at an afternoon tea party! Bring the water and butter to the boil. Once the butter is completely melted, reduce the heat to medium, add the flour and stir well with a wooden spoon. Cook the dough for a few minutes to dry it a little bit, this process take should take about 3-4 minutes. 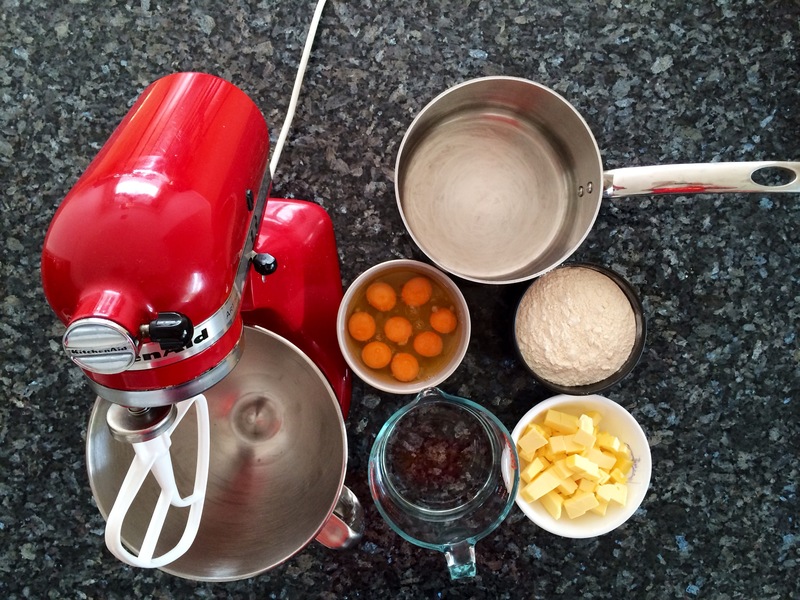 Transfer the dough into an electric mixer bowl and mix on medium speed with the paddle attachment to cool it down. The dough should just warm before you add the eggs. Start adding the eggs one at a time while mixing. Once the eggs are all mixed through, transfer the mix into a piping bag fitted with a plain nozzle. Line a couple of flat baking tray with greaseproof paper and pipe 2cm circle on the tray, make sure you leave about 1cm between each choux. Bake at 200 degrees for 20-25 minutes, the choux should sound hollow and feel a little hard when you press them between your fingers. Bring the milk, orange zest, Cointreau and vanilla pods to the boil. In the meantime, whisk the yolks, sugar and vanilla seeds together. Then add the flour and whisk until combined. Pour the milk over the egg mixture and whisk well until everything is mixed through. Return the pot to the stove and cook on medium heat while whisking until it thickens up. Once it starts boiling cook it for about 3 minutes more. Pour the crème patissière into a bowl, place a layer of glad wrap directly on top of it and leave to cool completely in the fridge. Mix the water and sugar together in small saucepan and cook the sugar until it becomes golden brown, and then take it off the heat. Make a small hole in the bottom of each choux using the end a pen. Pipe the custard in the choux using a piping bag fitted with a nozzle. Dip the top of the choux in the caramel and the Pearl sugar.